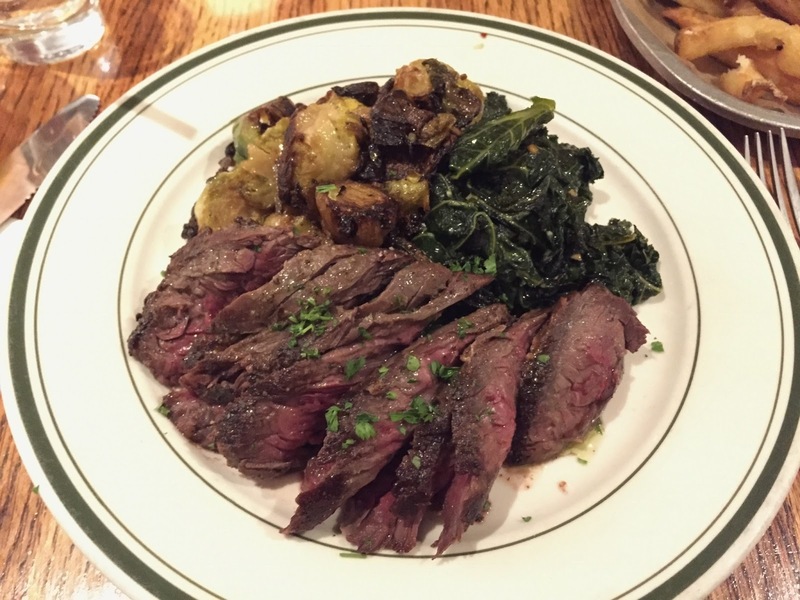 We read that one of the best burgers in the states is Sebastian's Steakhouse Burger at Brindle Room on Food & Wine. 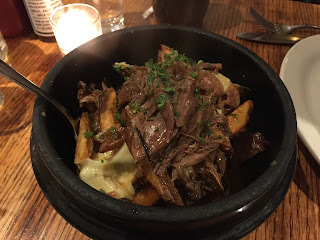 They serve Duck Confit Poutine during dinner time, so we decided to go and try those the other night. We booked for 5 PM and got there at 4:55 PM, and a staff said it'd open at 5 PM so we waited near the door like other customers. Others were walk-ins and they're told they wouldn't be able to hold a table till the group was complete but they could wait at the bar counter. We, who had a reservation and were complete group (pair), we're seated right after they opened the restaurant. "Guy Fieri ate here" sign on the wall. There're a jar of ketchup and a bottle of PGB Hot Sauce, a housemade spicy sauce. They also sell this hot sauce at the restaurant. Each table had a candle. Lightly sour and sweet, refreshing lemonade. 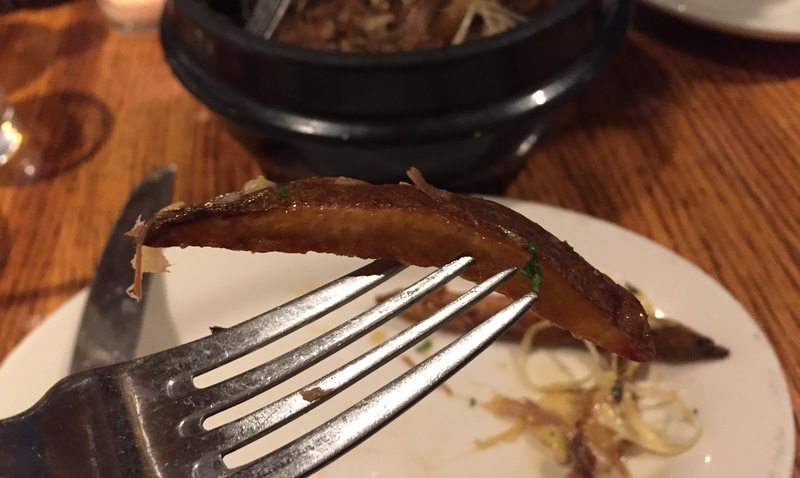 The slice of lemon wasn't included, but I stole it from my husband's diet coke. The bowl was as large and deep as bibimbap bowl. 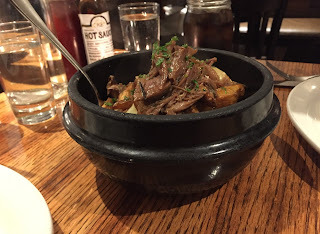 There're a lot of duck meat, and even though I'm not a fan of duck, somehow this dish was good, but not as a poutine. 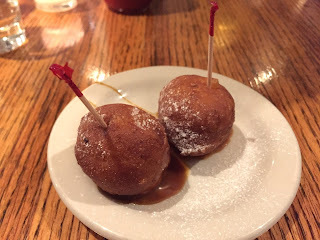 The gravy and the duck had star anise, cinnamon, nutmeg and rosemary flavors that set off the duck odor, and the duck was so tender that I didn't have to bite much. Cheese curds were melted and it might have been put into the oven after they sprinkled cheese curds. 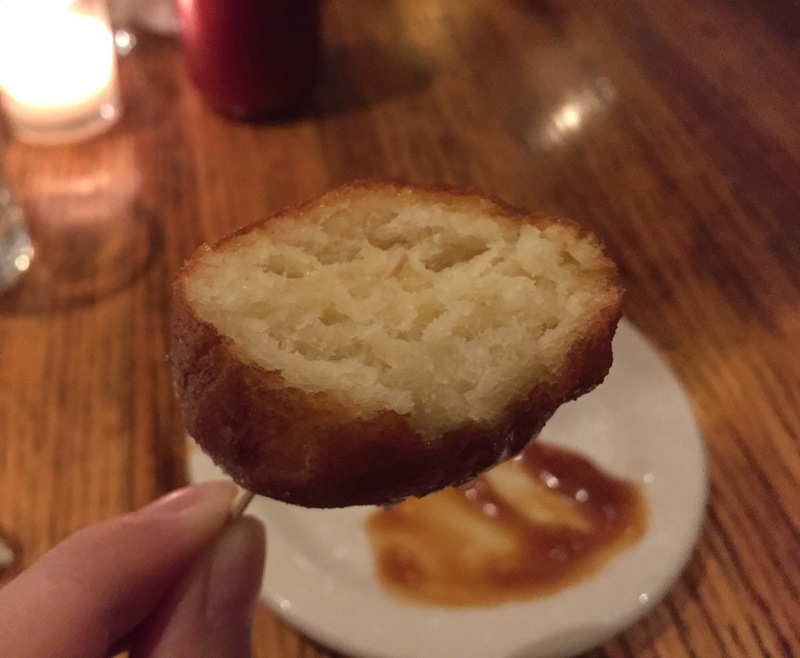 All the cheese curds were melted and stringy, which were very sad. However, some had subtle squeakiness still. The fries had skins on and they're steamy hot, but the gravy and duck confit made them soggy so that there's no single fry which were crispy. 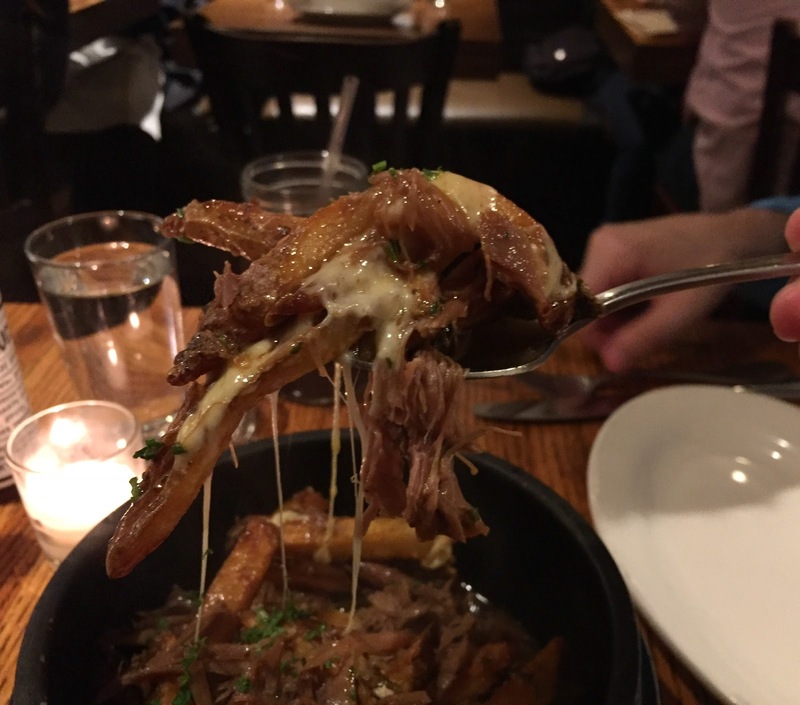 My preference for poutines is a half or less fries are covered in gravy and topped with non-melted squeaky cheese curds, and this poutine was quite soupy. It's a choose 1 protein and 2 sides, and I got Braised Kale and Brussel Sprouts. 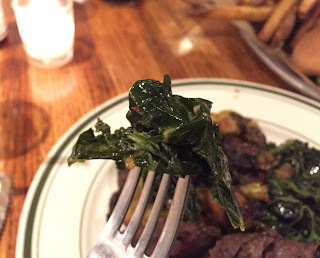 Braised kale was soft and seasoned with garlic, salt and pepper, and it had the characteristic bitterness. 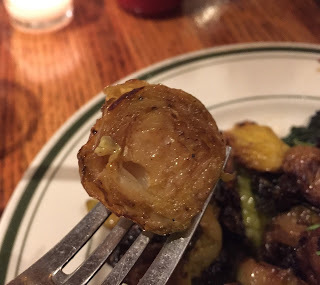 Brussel sprouts seemed to be grilled over the griddle, and about a half of them was overcooked/burnt and blackened. Properly grilled pieces had sweetness and light firmness in the cores. The center of the hanger steaks were red and cooked to medium rare as I asked, and they're tender yet had some chewiness. The edge pieces were almost well-done since they're flatter than the middle area. PGB Hot Sauce on the table gave me instant heat of hot peppers as soon as I put it in my mouth, and the spiciness lasted even after I swallowed it. This burger was the main reason we visited here, but when we ordered they didn't ask us how we'd like the meat to be cooked. As they suggest medium, you might need to tell them your preference if you'd like other than medium. Thick cut fries with skins on and pickles were served, too, and the burger was smaller than I had expected. The bun was grilled and it's a bit dried, and the thick and chunky patty was juicy but almost well-done. 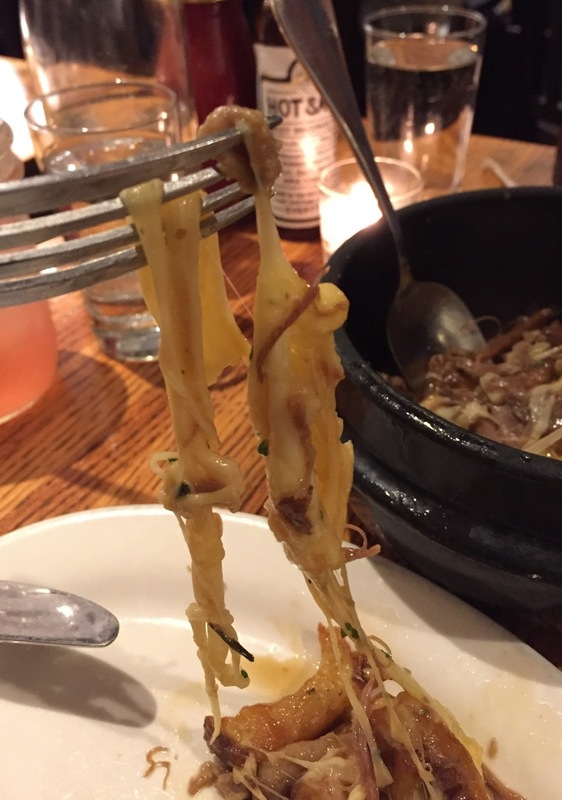 Caramelized onions were sweet and the melted American cheese was gooey. We've seen many articles praise this burger but I personally wasn't that impressed by this ordinary creation, and the thick cut fries were more enjoyable. 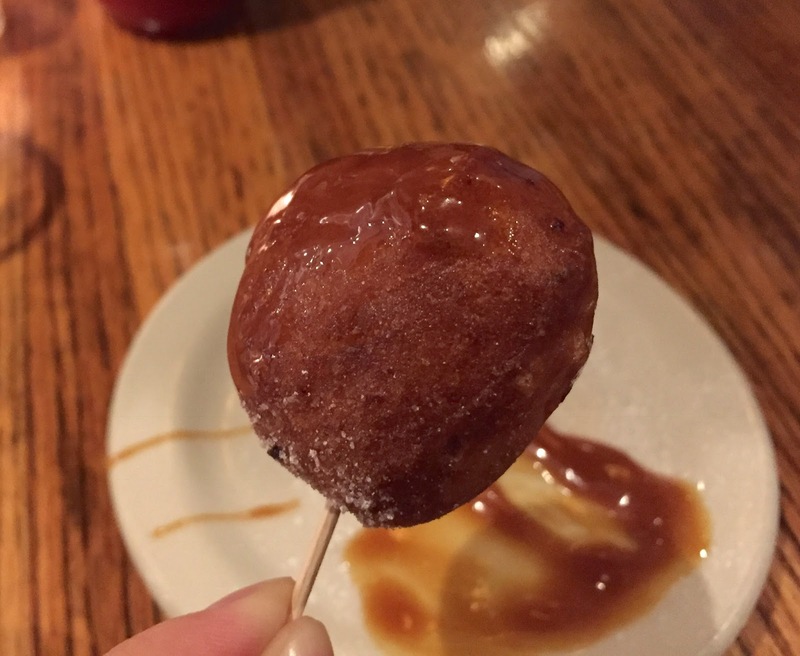 After the dinner, they brought us complimentary doughnut holes. Each ball was dusted in confection sugar and at the bottom, there's salted caramel sauce. It's a fluffy and bounty doughnut hole.